New Delhi : Prime Minister Narendra Modi is likely to take the final call on whether India needs to remain engaged in the ongoing negotiations for the contentious Regional Comprehensive Economic Partnership (RCEP) free trade agreement (FTA) or not, after a meeting convened by the Prime Minister’s Office (PMO) saw growing opposition to the deal from secretaries of various government departments. The meeting was called by principal secretary to Modi, Nripendra Mishra on 6 March to chalk out India’s strategy in the ongoing FTA negotiations such as with RCEP, Canada and Australia. A majority of around 15 secretaries present in the meeting including defence, economic affairs and agriculture opposed the proposed RCEP deal, holding that it may hurt India’s interests in their respective fields, a government official with knowledge of the meeting said, on condition of anonymity. While the finance ministry has opposed the investment chapter in RCEP which is more liberalized than the model bilateral investment treaty proposed by India, the agriculture ministry is against giving market access in dairy sector to member countries such as Australia and New Zealand. “Nripendra Mishra is likely to communicate the overwhelming view among secretaries not to move ahead with the RCEP deal to the prime minister who will take the final call on the matter,” the official cited earlier said. 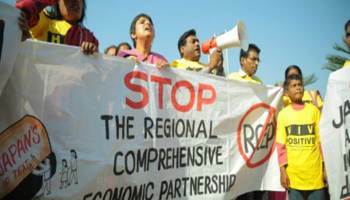 RCEP members have been putting pressure on India to open up its market for more than 90% of their traded goods, while they remain reluctant to India’s proposal to allow free movement of Indian skilled professionals in the RCEP region. There is growing clamour from industries such as iron and steel for India to either exit RCEP or resist its early conclusion. The consultation by the PMO and outcome of the meeting comes at a time when former foreign secretary S. Jaishankar and chief economic adviser in the finance ministry Arvind Subramanian have openly advised caution in moving ahead with RCEP. RCEP is a grouping of the Asean’s (Association of Southeast Asian Nations) 10 members plus India, China, Japan, South Korea, Australia and New Zealand. It envisages regional economic integration leading to the creation of the world’s largest regional trading bloc, accounting for nearly 45% of the world’s population with a combined gross domestic product of $21.3 trillion. In an interview last month, Subramanian said India needs to be extra cautious and take into account geostrategic issues while moving ahead with the RCEP trade deal as it will also mean opening up the market to its adversary China. “I am a little bit ambivalent about RCEP, as it will involve a lot of opening up to China. We have a natural complementarity vis-à-vis Europe. We export labour-intensive goods to Europe and they export capital-intensive goods to us. In case of the Asean and China, it’s not the same thing. So what’s the advantage for us (in RCEP) ? I am not saying it’s bad or it’s wrong, but I am saying we need to think more carefully about that. There is also the geostrategic dimension we need to take into account. So, that’s a more difficult and richer discussion that the government needs to have,” Subramanian said. India has a $50 billion (around Rs3.2 trillion) trade deficit with China. Tensions between the nations have been high in the past over Chinese military intrusions, most recently in the Doklam area of Bhutan, and the China-Pakistan Economic Corridor, which is proposed to pass through Pakistan-occupied Kashmir. Former foreign secretary S. Jaishankar, at a recent presentation before the parliamentary standing committee on commerce, called for “observance of due restraint” and not concluding trade arrangements not in India’s medium-term interests. Biswajit Dhar, professor of economics at the Jawaharlal Nehru University said RCEP is simply non-negotiable for India as any further preferential tariffs to its member countries including China will be politically unacceptable. “The kind of tariff liberalization that member countries are demanding, forget industry, India may not even be able to protect its vulnerable agriculture sector. India now needs to take a political call on the deal,” he added. RCEP is a grouping of the Asean’s (Association of Southeast Asian Nations) 10 members plus India, China, Japan, South Korea, Australia and New Zealand. It envisages regional economic integration leading to the creation of the world’s largest regional trading bloc, accounting for nearly 45% of the world’s population with a combined gross domestic product (GDP) of $21.3 trillion.